Congratulations to all the AIA 2010 Sandcastle Competition winners and participants! 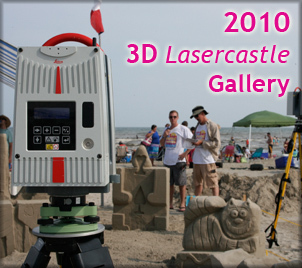 We enjoyed attending as a Silver Shovel Sponsor and are very pleased to present this year's 3D "Lasercastle" Galleries. After announcement of this year's winners, we quickly mobilized to complete high-definition 3D LiDAR laser imaging of the sandcastles. This is our second year of documenting all the hard work before the sea takes it all back! 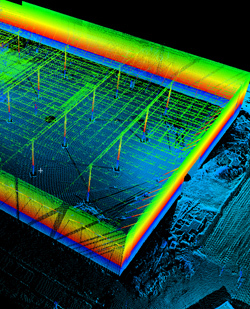 Apart from accurately recording the sandcastles for history, laser 3D imaging also allows us to produce views and models and present the data in many different ways and forms. Visually stunning images and fascinating facts are presented here for the three trophy and honorable mention winners along with the public favorite and college division winner. All of the data is also available for download to enjoy and explore on your own. Follow the links above to see the sandcastles or the ones on the left to learn more about how the imaging works and how the technology is used in architecture, engineering and other fields. You can also learn more about the 3D holograms of last year's winners that were exhibited in our tent on the beach. "Train Your Dragon" by Matrix Spencer Architects. in increments of 4 millimeters. 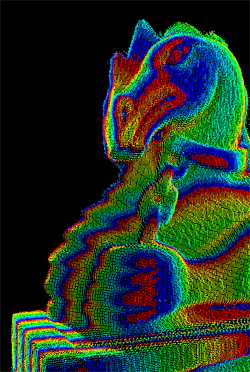 Smart GeoMetrics and Zebra Imaging of Austin, Texas produced auto-stereoscopic 3D holograms of the 2009 winning sandcastles and exhibited them at the 2010 event. As part of the 25th Anniversary of the AIA Sandcastle celebration next year, the 2009 holograms along with the new ones of this year's winners will be on display at the AIA Houston Gallery. Dates to be announced! Sign up here if you would like to be notified about the event. Since you really can't visualize the 3D holograms on this 2D screen, it does not do us much good to include them on the website. You'll have to take our word for the fact the are stunning examples of the latest high-tech visualization technology. Auto-stereoscopic holograms do not require "3D glasses" or any other aid except a standard light source. Any 3D-object can be printed as a Zebra Hologram. by Page Southerland Page Architects. 3D glasses are not required to view auto-stereoscopic holograms. "3D is the new 2D" Its just that simple. 2D visualization is becoming a thing of the past. Architects and Engineers must be ready to make the change to a full 3D workflow. 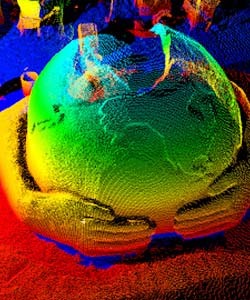 Smart Geometrics provides products and services which enable you to bring the "real world" into your office in full 3D. From On-site HD laser scanning to 3S imaging to help with business integration and training, our goal is to help you make the jump to 3D. Contact us for a lunch and learn at your offices our ours. We'll be happy to bring your executive and technical staff up to speed!